Today began like every weekday: I hit the snooze button several times, slept a bit more in the shower, brewed some Dunkin' Donuts coffee for the road and forgot my lunch. Although optimism doesn't come naturally to me, my professional training has taught me to find a positive spin in every bad situation. This technique allowed me to transform forgetting today's forgotten lunch into a Sanditunity. Lacking the gumption to leave the office to buy a sandwich, I said a brief, quiet prayer to the Sandwich Gods that some quasi-edible manna would be for sale in the vending machine. There, I discovered a grizzly and mumbly man stocking the machine with fresh but unappetizing fare. "Fresh sandies!" I exclaimed to myself silently. I waited for the bearded sandwich stocker to leave before returning to examine what treasures he had left. It felt like I imagine Christmas feels in countries in desperate need of food. A woman buying a breakfast burrito warned me of "slim pickins'" — an ominous sign. The pickin's were slim, indeed. The machine was nearly empty, save the odd chili dog. A few of the slots contained only a fork or single mustard packet: the leavings of clever pranksters. The only thing vaguely resembling a sandwich is pictured below. I bought it for a song, but the prospect of eating it had a sickening Fear Factor feel. How would I gag this thing down without Joe Rogan's yelling as encouragement? 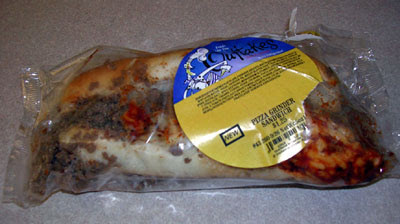 It was called a "Pizza Grinder Sandwich" and was distributed by a company called "Outtakes." From the look of the sandwich, it was in fact comprised of other sandwiches' outtakes left on the cutting room floor. Outtakes' mascot is a painfully thin chef mixing something in a bowl. He appears to be French. The sandwich itself was akin to a sloppy joe. Fistfuls of low-grade ground beef mixed with tomato sauce were tossed haphazardly onto a split hot dog bun and topped with mozzarella cheese. The mess of meat and sauce had spilled out from its hard plastic container and into the outer plastic wrapper. As you can see, the generously dubbed sandwich had little to offer by way of presentation and plating. Regardless, I soldered on, heating and eating the slop pile. To my surprise, it tasted better than it looked. The flavor reminded me of a Stouffer's French Bread Pizza; the sugary sauce and mozzarella tasted identical in fact. Add some Taco Bell-style ground beef and a hot dog bun and you've got yourself an Outtakes Pizza Grinder Sandwich. If recreating this abomination at home, I recommend placing the bun on the floor and dropping the toppings onto it from at least six feet over to recreate the sandy's troubling sloppiness. Developing a rating for this sandwich is not easy, partially because my rating system is almost totally arbitrary. Plus this sandy's a special case with some conflicting factors. First, I've gotta shave several sandypoints for its repulsive appearance. I must add at least one back for its pleasantly non-awful flavor. But I still can't recommend it or suggest that it's a good sandwich in any context, except for its affordability. Looks like it's getting a 1.5.